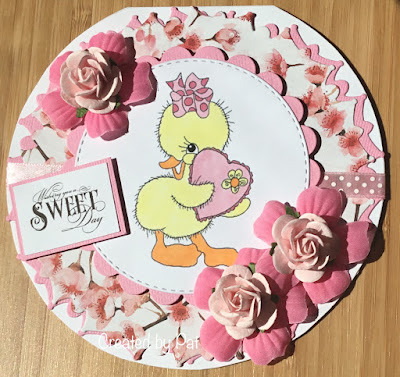 A lovely card Pat, such a sweet image and pretty pinks. Awww adorable and so gorgeous Pat. Totally cute and very pretty, love the circular shape! Oh so cute, Pat! I love the sweet image and those fabulous flowers! Gorgeous card, Pat - this little chick is adorable and I love the shape and "pinkness" you've created. Hope you're not experiencing snow again - have a good evening.